The announcement of a military training centre of excellence for St Athan in the Vale of Glamorgan has thrilled politicians who have lobbied for it. 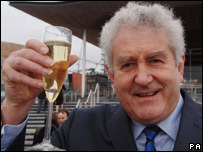 First Minister Rhodri Morgan said it was a massive boost for Wales. He said so many public and private organisations had worked together that it gave the St Athan bid "the vital clout that comes from unity". Conservative economic spokesman Alun Cairns AM was "elated" that months of lobbying had paid off. But Mr Cairns warned the new development needed to be handled sensitively as the influx of as many as 2,000 recruits training on the base would "surely pose issues for a small community such as Llantwit Major". Liberal Democrat assembly leader Mike German said it was excellent news for the south Wales economy but there was still vital work to be done to make the most of the opportunity. He said: "The challenge is for South Wales to prepare for the impact this will have and to develop relevant skills training in our schools, colleges and universities. Welcoming the announcement, Plaid Cymru leader Ieuan Wyn Jones said it was vital to maximise the employment prospects of people already living in the area. He said: "The knock-on effect of such a large project on the community will require great investment in health, education and transport services and it is therefore essential that the government invests adequately in the area." Intense lobbying is understood to have played an important part in clinching the deal for Wales. Rhondda Labour MP Chris Bryant led the Parliamentary group campaigning for St Athan. He said: "What we stressed all along was the quality of the bid." But Mr Bryant said Wales moved from rank outsider to victory by organising a huge range of activities in Westminster and Wales over the past 12 months. They included getting Welsh MPs from all parties on board, meeting all the UK ministers involved in the decision, holding events in Parliament and organising letter writing campaigns. This work was backed up by getting support from local businesses, newspapers and drawing up petitions. A UK Government source said Wales also had the advantage of an Assembly and all that came with it pushing St Athan's case, when the rival West Midlands bid just had a regional development agency. Asked if Wales was given an unfair advantage, Assembly minister Carwyn Jones said: "Having an elected assembly is always an advantage and that's something we should celebrate."